If you are a Mac user, you need to know your identity – UMPASS for authenticating yourself to the University IT services, you need to know how to get connected to the University campus network through either wireless or wired network, you need to know how to access your university email account (on Microsoft Exchange), you need to know how to access the departmental database (on ShareDM), you need to know how to share data with Windows users, you need to know how to print files to the department network printers, you need to know how to access UM intranet resources with SSLVPN when you are outside campus. For the convenience of Mac users, ICTO has prepared guidelines for the Apple Mac users to access University IT services and resources. These guidelines provide steps to connect Apple Mac to the various services and applications provided by ICTO. UMPASS is universal login credential for accessing various services and applications you use every day. 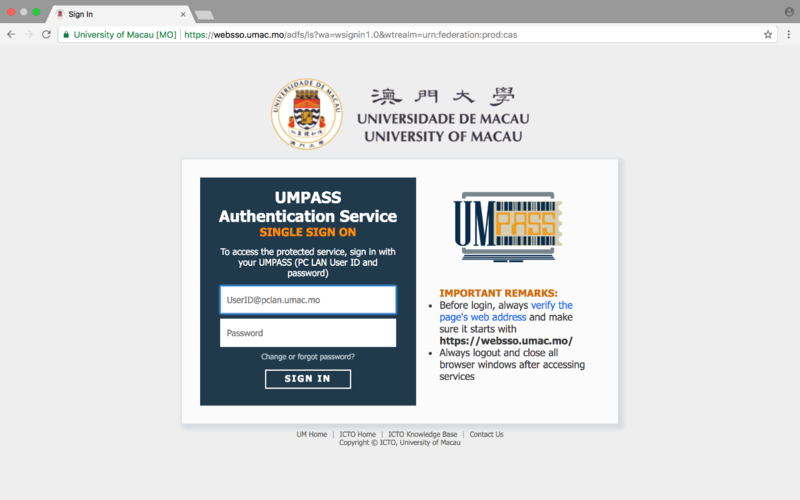 Mac users can use their web browser to access UM resources or applications after login to UMPASS. 1. 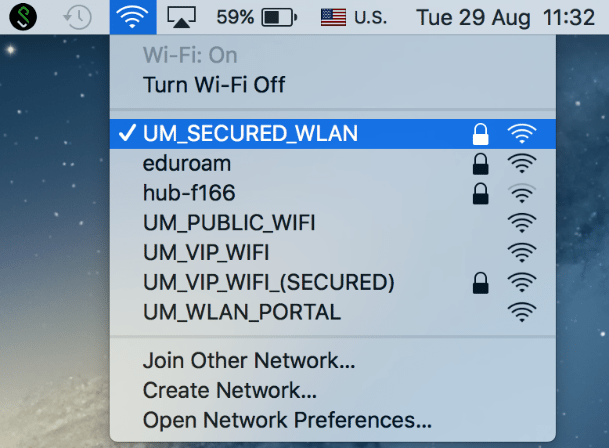 At the Mac, click the Wi-Fi icon and then select “UM_SECURED_WLAN”. 2. 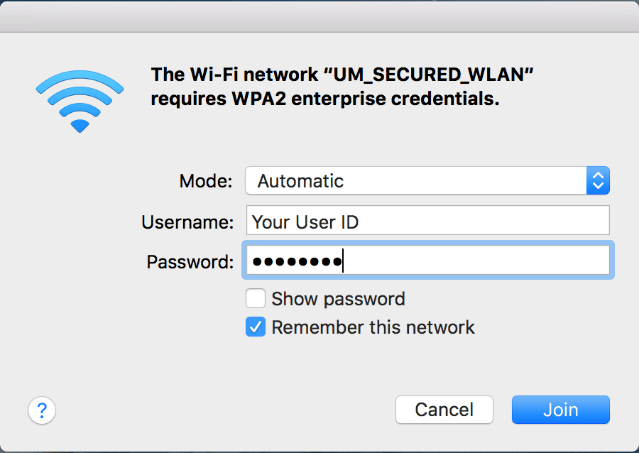 After selecting “UM_SECURED_WLAN”, enter your UMPASS ID (your user ID) and password. Click Join. 3. 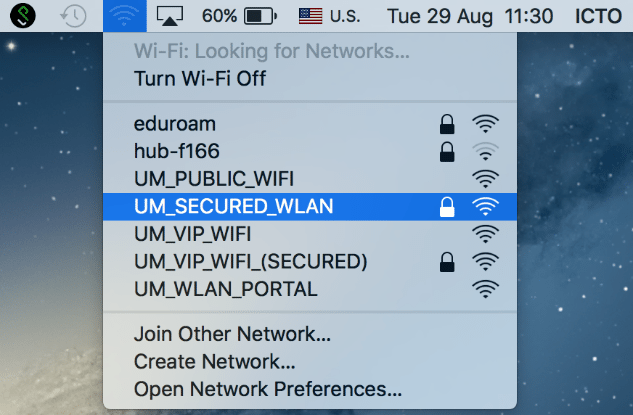 If you are prompted to accept a certificate installation, select “Yes” to connect to UM_SECURED_WLAN. UM wired network is available across the campus at offices, laboratories, student living areas. 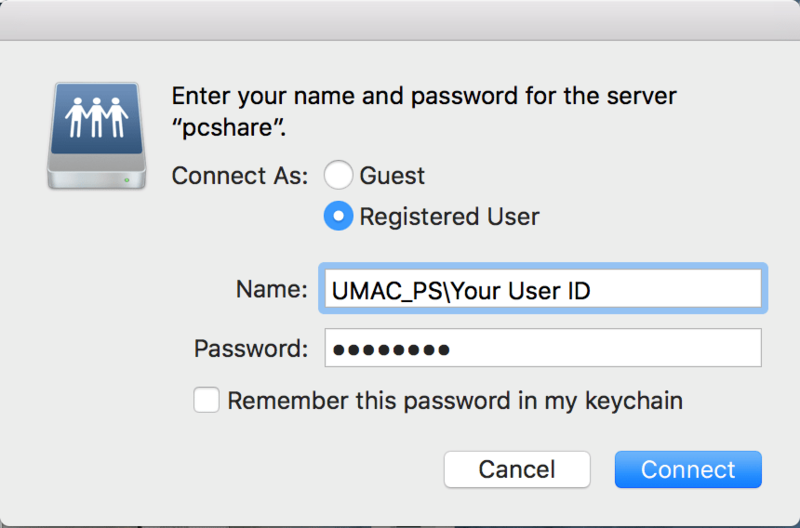 To get connected, you need to login with UMPASS ID and password at your Mac. Once connected, you can access the University’s network based resources and services. The configuration guide is linked here. Configuration Guide ——->How to connect UM Wired network in Mac OS 10.7 (or higher version)? 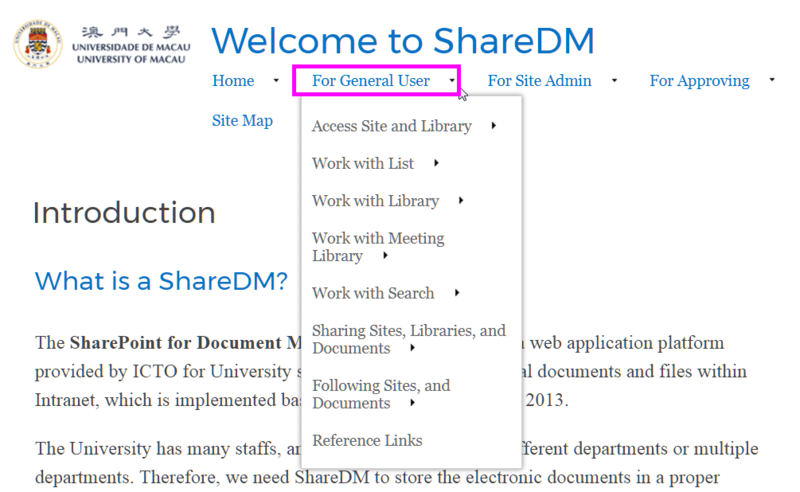 ShareDM allows department to set up websites for staff to manage their documents. Mac users can use their web browser on Mac to access ShareDM. 2. Login with your UMPASS ID and password. 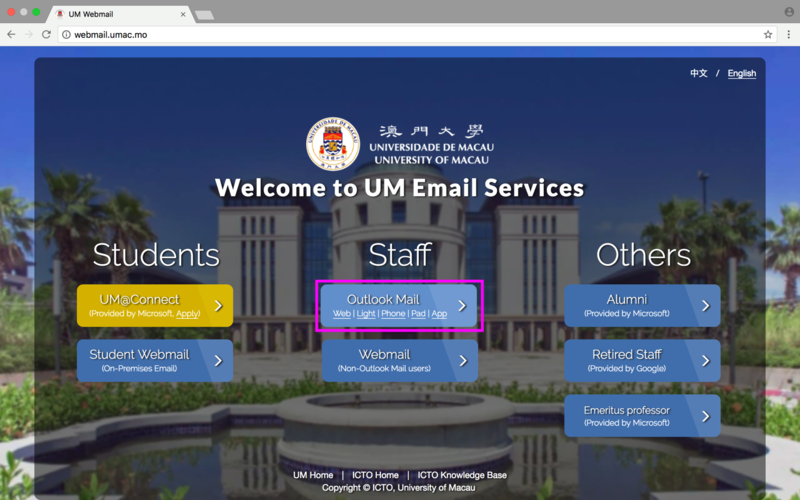 The university Staff Email system is a stable and secure email platform based on Microsoft Exchange solution. Mac users can access the email service by using MS Outlook Client or Outlook webmail. They are available for Mac. Configuration Guide ——-> How to configure Outlook 2011 on Mac to access UM Staff Email? *If your Mac is not installed with Outlook or Microsoft Office, UM staff can download the Microsoft Office 365 ProPlus for free after registering Office 365 ProPlus account on ICTO Account Information Page. Once registration is completed, you can login to Office 365 to download and install Office 365 ProPlus. For detail, please refer to ICTO website. 1. From the Mac OS X Finder, press “Command” + “K” to bring up the Connect to Server window. 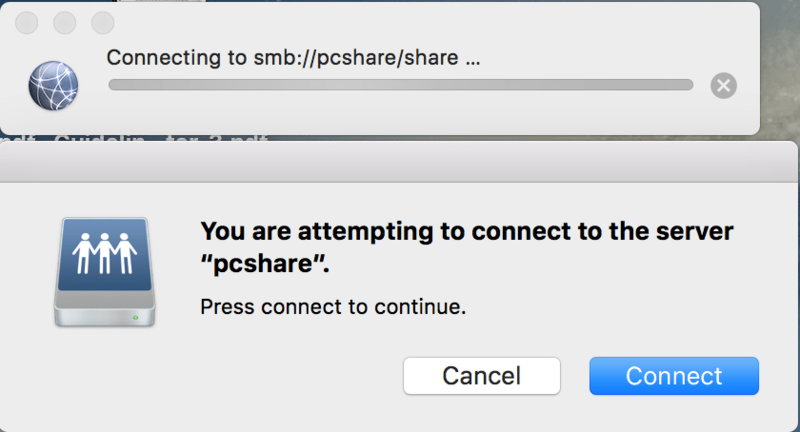 Enter the path of N drive “smb://pcshare/share” and click “Connect”. 2. Press Connect to continue. 3. Enter your UMPASS ID (Your User ID) and password and click “Connect” to mount the network drive. 4. The N drive will now appear on your desktop and in the Finder window sidebar. Staff can connect their Mac to the department network printers. Before setting up the print queue, please mark down the print queue name of the network printer you would like to connect and then follow the configuration guide linked below to configure your Mac. 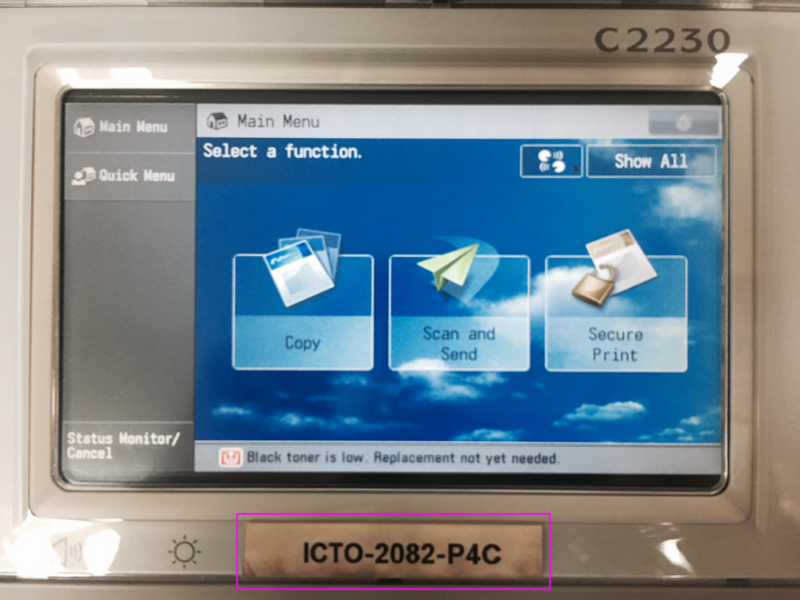 Configuration Guide ——-> How to connect staff network printer in Mac OS? SSL VPN enables you to access the UM Intranet resources from Internet with web browsers or a SSL VPN client in a secure way. Mac users can login SSL VPN by using Web Browser or SSL VPN Client. 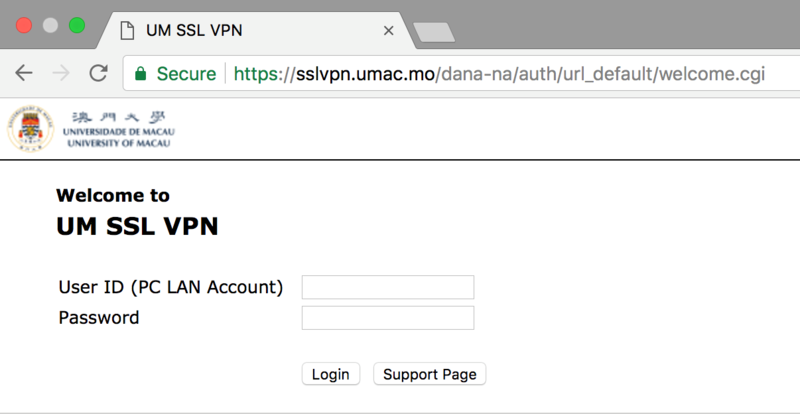 To login, please access https://sslvpn.umac.mo/ and login with your UMPASS (PC LAN User ID and password). For intranet resource (i.e. authorized application only accessible via intranet) that cannot be accessed through web browser, you may install the SSL VPN Clients. 3. Press “Open” to continue.